Interesting things are happening at the school! Today and tomorrow we have Chris Nordgren, VFX and 3D-artist at Mojang in the house, showing our 3D-art students how to create stunning effects for their games. Chris started out with his mind set on becoming an environment artist but changed the course of his journey and started out as a tech artist instead. Before joining Mojang, he has worked at studios such as Riot Games and Crackshell, as well as freelancing for a number of awesome clients. Being a great VFX artist, we’re very happy to have him help our students with adding that extra wow-factor in future projects. If you want to check out more of his work you can follow Chris on Twitter @chrisnordgren. What's it like to be a game programmer and where do you even get started? 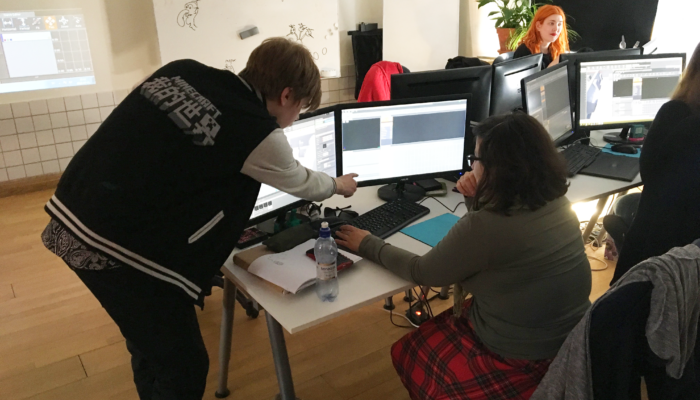 Olivia changed paths after studying economics and French for two years, and today she's one of the junior game developers on her way into the industry. Today the Swedish National Agency for Higher Vocational Education approved two new program starts for Futuregames. Game Designer and 3D Artist will also start in the spring of 2020. Welcome to a Meetup about Futuregames' higher vocational educations in game development. Tuesday April 9 at 17.00. We're inviting you to an evening about our programs Game Designer, Game Programmer, 2D Artist and 3D Artist.